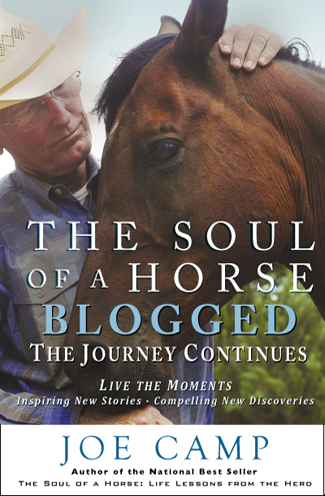 The following videos are on The Soul of a Horse Channel on You Tube and on Vimeo. Or merely click below to see the video of your choice. 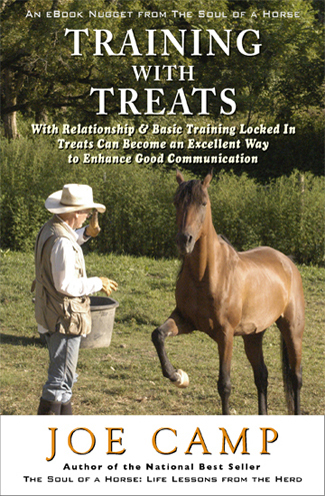 How to Catch Your Horse in the Pasture – A Guaranteed Method from Joe Camp on Vimeo. 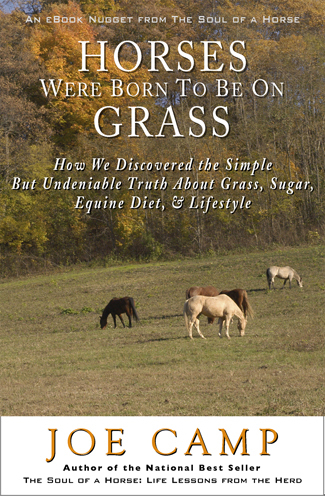 Born Wild – Sequel to The Soul of a Horse – Book Trailer from Joe Camp on Vimeo. From the soul of a floppy-eared dog to the soul of a horse. 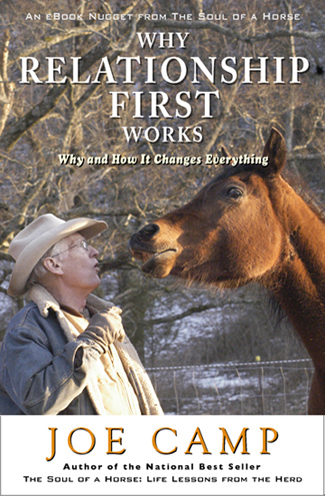 The Soul of a Horse – Life Lessons from the Herd – Book Trailer from Joe Camp on Vimeo. For those who remember Noelle and Malachi, you’ll know why the video is entitled Here We Go Again. It’s the beginning of a brand new journey with yet another pregnant mustang from the wild and her new baby. This begins at the BLM and ends in her new home. A mustang who had never willingly touched or been touched by a human. Here We Go Again from Joe Camp on Vimeo. “I had never laid hands on an unhandled horse. Or touched a new foal, handled or otherwise. Never mind one conceived in the wild. So you might think I’d be nervous. For reasons unknown I didn’t think I was. I was just anxious. Excited. At least that’s what I kept telling myself. The appropriate term, I believe, is naive.” Thus begins Chapter 6 of Born Wild. 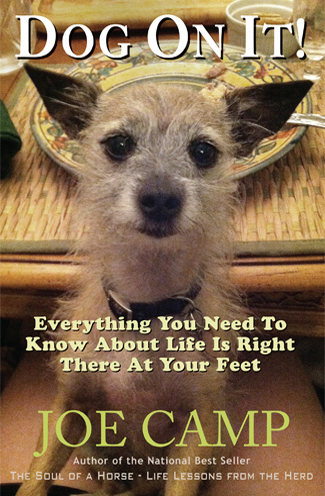 The anxiously anticipated sequel to Joe Camp’s National Best Seller The Soul of a Horse Life Lessons from the Wild. Born Wild – Chapters 6 & 9 – Malachi – Our First Baby – Conceived in the wild from Joe Camp on Vimeo. A mustang conceived in the wild, born to us. From two hours old to two years old. Miss Firestorm from Joe Camp on Vimeo. The most amazing thing happened on this day! It reminded me why we have been so obsessive about getting the relationship right with each of our horses before anything else. Even before training. See The Difference Relationship Makes from Joe Camp on Vimeo. 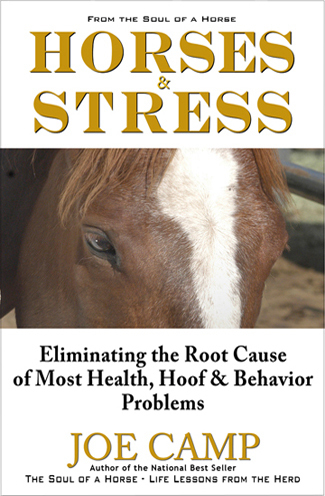 When we first discovered that the genetics of a horse prescribe a lifestyle of living out 24/7 with lots and lots of movement we threw up our hands in frustration. We had no access to land other than a tiny plot behind the house that was virtually straight-up-and-down steep some of it totally unusable. Horses in the wild out in the Great Basin of the western United States – where their genetics evolved – travel 10-20 miles a day looking for grass forage, water, and staying away from predators. How could we even get close to replicating that with what we had to work with? But we did, all covered in this video. Our Paddock Paradise – What We Did – How We Did It – and Why from Joe Camp on Vimeo. Two months ago Miss Saffron, a BLM pregnant mustang from the wild, had never willingly been touched by a human. Only those BLM folks moving her in and out of squeeze chutes and trailers. Eight weeks ago (3 days after we brought her home) she gave birth to her baby. Both of these mustangs have been nothing short of astonishing. See why. Born Wild – Chapter 11 – Two Mustangs from Joe Camp on Vimeo. cute interchange from a very interested peanut gallery. First Romp In the Pasture for Saffy and Stormy from Joe Camp on Vimeo. On Miss Firestorm’s 10-week birthday we decided to see how her mom Saffron and Noelle, both mustangs out of the wild, would do sharing a pasture; the goal being to finally get the herd all together as one, all out 24/7 with both pastures to roam. The result was a disaster. Big mistake. You might have seen the still photos on the blog but only now have I risen to the occasion of getting the video edited and up. It’s brutal. Mostly because Saffy simply would not give up, and Noelle kept coming. That was Round One. Clearly too early. Too soon. We now believe that Saffron had more than dominance on her mind. She was protecting her baby. Back to the drawing board. Or to separate pastures in this case. 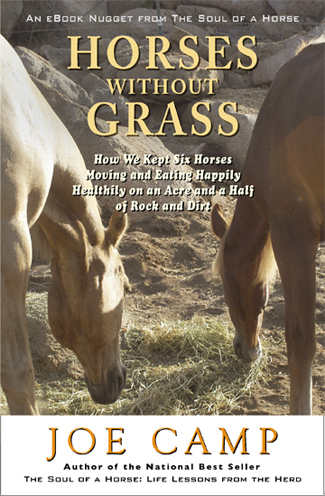 For the next four-and-a-half months we rotated horses and pastures every day so that both Noelle and Saffy would have time with all members of the herd – except each other – and everybody would get equal time in the east and west pastures. What a a logistical nightmare! We’re now up to Round Three, and they’re all compressed into a five minute video cleverly entitled: Two Dominant Mustangs – Rounds 1, 2, & 3 :). Two Dominant Mustangs – Rounds 1. 2, & 3 from Joe Camp on Vimeo. This is Benji and Malachi, our first baby conceived in the wild. You just have to see it. Much fun. Almost 40,000 Views as of this writing. Benji Gets a New Baby… Horse from Joe Camp on Vimeo. 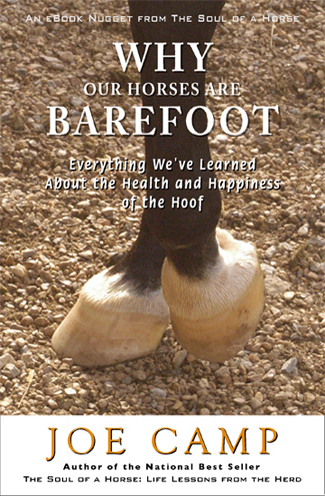 Why Our Horses Are Barefoot? Joe talks about the “lightbulb” moment he and Kathleen had, and all the reasons that left them no choice but to take their horses barefoot. 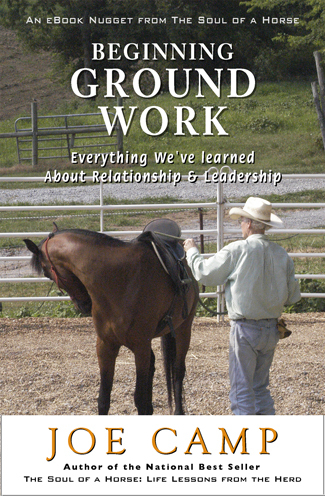 Joe Camp discusses why he and Kathleen changed from feeding their horses at table height to feeding from the ground. Another “lightbulb” moment. 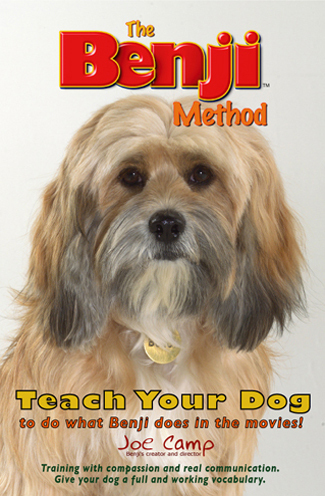 Over the years Joe has written and directed five Benji movies starring three different Benji’s. These are clips from all of them. See if you can tell who’s who. Benji Movie Memories from Joe Camp on Vimeo. It took six big men to wrestle Mouse into a trailer to go to Monty Roberts’ farm where we met her. She had been rescued from horrendous conditions by the Animal Rescue League of Iowa. She was under a year old. Skin and bones. Her feet looked like elf shoes. And she was terrified of people. This video is two years later. Mouse – Our Rescue – Two Years Later from Joe Camp on Vimeo. A delightful music video of barefoot horses, free from cages and stalls, happy as clams, living as nature intended. 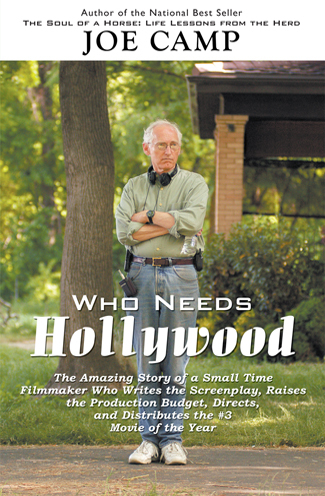 My cover boy Cash makes his very first trip to a TV studio. Watching the huge camera crawl all around him is watching pure trust in action. Noelle, our first pregnant mustang fresh from the wild, was loaded at the BLM facility in Reno on December 20, 2008. Camp-like I had forgotten the video camera so Kathleen shot this with her little point-and-shoot; thus, sorry, no sound. She made the trip from Reno to our (then) home in Valley Center, CA is about 12 hours, very little the worse for wear. 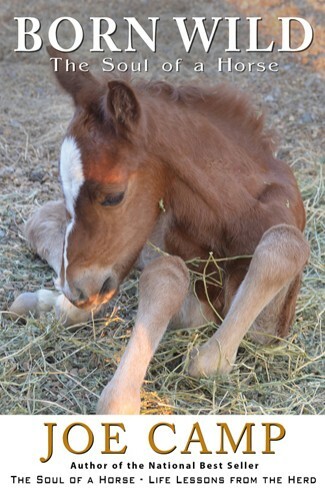 Her baby, Malachi, was born on March 3, 2009 and her entire story is chronicled on our blog: https://thesoulofahorse.com/blog. Day 18 with our mustang Noelle who had never touched or willingly been touched by any human before coming to us. Kathleen captured this my favorite Noelle video with her little point-and shoot camera. I was sitting on a rock holding the bowl, just being silent, and still. Waiting. It’s a great lesson in the rewards of patience. And somehow just knowing that such results actually do materialize helps me with my genetic disposition to always hurry up. There’s no sound but if you can make it through to the end you’ll never forget it. Day 70: Noelle had begun to bag up so we were expecting any day. This was probably not the best day Noelle and I have had, but I suspect she had other things on her mind. It was an unseasonably warm 87 degrees for March (in an unusually warm California winter) and the flies (the little bitty bitey ones) and bees were bothering all of us. You’ll hear Kathleen complaining as she shoots the video. My youngest son, filmmaker Brandon Camp (Love Happens), put together a lovely video of moi, the horses, and two of my grandkids over the New Year holiday. Very special.